I have got some great news. For 30 years “Outdoors with Joey Mines” has been a 30 minute show. Beginning October 5, 2013 my show will be going to 1 hour long. Air time on The Walk TV is Saturday from 9:30 EST until 10:30 EST. “Outdoors with Joey Mines” is also streaming on the internet on several stations. “Outdoors with Joey Mines” is also on YouTube. This is just a few of the 100+ caught today. Book your trip now. I still have a few days left in June. I am excited to be on a new national network called Walk TV formally Legacy TV. My show will air Saturdays @ 10AM. I have enclosed a list of the 234 TV stations that will be carrying the show. Click on LOGO to see the station nearest you. This week Joey returns to Costa Rica for part 2 of fishing in Costa Rica. We stayed at CRVillas.com. This week joey goes to Costa Rica. We stayed at CR Villas. This was a outstanding trip that I would recommend for the entire family. This past week we spent several days at “Eagle Island” (Private Islands of Georgia). This is a wonderful getaway. 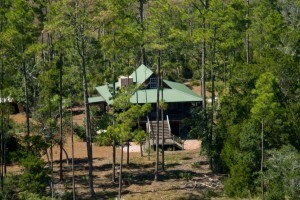 Eagle Island is a 10 acre island with a house that sleeps 12 people. Captain Andy Hill is the owner and has made this place a special place with the utmost in privacy. I have enclosed the “Low Country Boil Recipe” as well as the first of 2 shows taped with Captain Wendell Harper. Fill a large pot with water. Leave enough room in the pot to accommodate the food in order to prevent over boiling. Bring water to a boil. Next, prepare the Private Islands of Georgia Cajun Seasoning Blend (recipe below) and add to boiling water. Melt butter in large sauce pan on low to medium heat. Mix all of the dry ingredients from the Private Islands of Georgia Cajun Seasoning Blend in bowl and stir with wire whisk. Pour contents of mixing bowl into melted butter and stir with wire whisk until well blended. Pour fresh squeezed lemon juice into pan and stir. Add jalapeno pepper slices and stir. Add mixture to boiling water, and now the fun begins! Note – other ingredients that can be added to personal taste are rutabagas, sweet potatoes, crabs, crawfish or the ‘kitchen sink’. Adding extra potatoes and onions allows for leftovers that can be used for some great tasting hash browns the following morning. After adding the Private Islands of Georgia Cajun Seasoning Blend to the boiling water, you are now ready to add the food. The food items are added in order of longest to shortest to cook. First, add the potatoes and boil 10 minutes. Next, add the carrots, sausage and whole onions. Return to boil. Add corn and return to boil. Then, add the shrimp last. Cook until shrimp are pink in color, approximately 3-5 minutes. Be careful not to overcook the shrimp! Note – outdoor gas cookers are typically used. A large pot on the range can also be used when outdoor gas cookers are not available. Cooking outdoors is fun, so get started today! 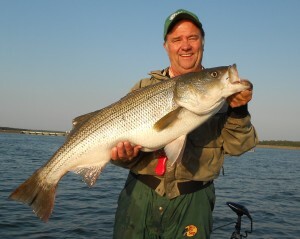 Stripers are biting in the main lake on West Point. I had a guided trip today and my customers caught 36 stripers between 8 Pounds and 24 pounds 14 ounces. This is the big one. 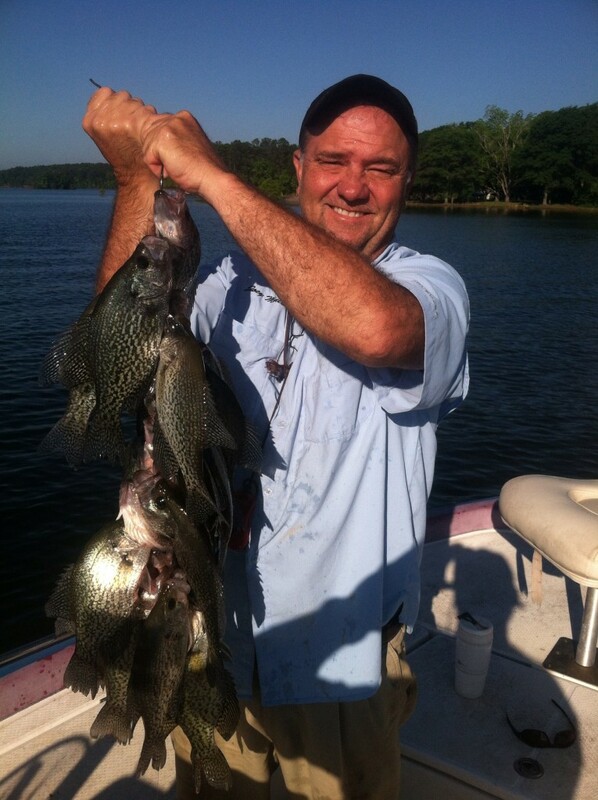 Crappie are also biting as good as I have seen in many years. If you want that trip of a lifetime, the time is now. This is what is called a Whopper Daddy. This Blue cat was caught Thursday on a guided fishing trip on West Point. My customer was Little Bill from Columbus Ga. The fish weighed between 35 to 40 pounds. We released the fish unharmed. 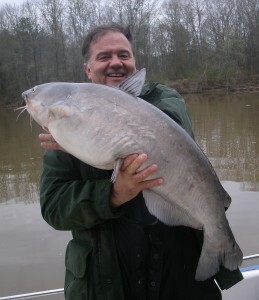 I didn’t realize this was probably the new lake record for Blue catfish on West Point. I guess we will have to re catch the fish to set the new record. Crappie and stripers are biting so book now. Don’t forget to like “Outdoors with Joey Mines” on facebook.